The aversion to non-harmful touch, tactile defensiveness is no fun to handle. People with such hypersensitivity have troubles processing sensory information because of a weak functioning tactile system. They react negatively or adversely to touch, and some may even display escape-like behavior when being hugged, touched, and kissed. Due to this fact, sometimes it’s difficult to say if deep touch pressure could help people with tactile sensitivity. Let’s start with understanding what sensory defensiveness to help you find out more information about this condition. 1 What Is Sensory Defensiveness? 3 How Does Deep Touch Pressure Work? 4 What’s the Hug Machine? Avoiding grooming activities like teeth cleaning, washing, nail clipping, etc. The tactile system helps to identify various objects in the environment and protects you from danger. When you over-respond to any sensory input, you might inefficiently process sensory information from the tactile system. When many people respond to certain touch positively, you might experience a “fight or flight” reaction to it. Sensory defensiveness is often linked to poor reticular or limbic system processing. Addressing the sensory-integration problems early helps to handle tactile sensitivity more effectively. Deep touch pressure therapy is one of the best ways to solve those problems. How Does Deep Touch Pressure Work? While light touches bother people with tactile defensiveness, firm touches usually help them learn to reduce negative response to touch. Deep pressure massage, without lotion or with unscented version, helps to significantly improve the aversive or defensive reactions to daily stimuli. Some people with tactile sensitivity opt for firm pressure provided by compression products, such as ace bandages or pressure vests. In order to find what works best for you, consider trying one product at a time for at least two weeks before figuring out if it works for you. Weighted products, such as blankets, lap pads, vests, etc., have an effect similar to that provided by compression products and deep pressure massage. 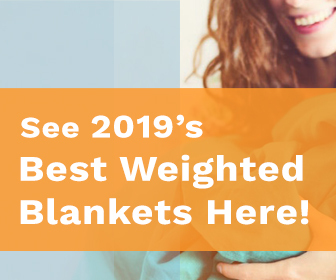 Weighted blankets are among the most popular weighted products, which help children with a sensory processing disorder1 , including tactile sensitivity, calm down and rest before nap or bedtime. When a child is mobile, it’s recommended to use a weighted vest. It should be 10 percent of their weight. The weight of a heavy quilt also depends on the child’s age and weight. Typically, it’s between 5 to 8 pounds. Deep pressure therapy refers to a type of tactile sensory input that’s usually provided by firm stroking or holding, cuddling, squeezing, and hugging. It helps to stimulate the joints and muscles of the body, and thus can improve modulation and self-regulation, and reduce anxiety. The therapy aims to tame the proprioceptive receptors and dampen tactile defensiveness. It isn’t for everyone, though. Be sure to consult a professional occupational therapist, especially before trying any compression or weighted product. Also known as the hug box or squeeze box, the hug machine is a deep touch pressure device created by Temple Grandin (more about her in the next section) that has been proven to relieve tension, hyperactivity, anxiety disorders, and tactile defensiveness. It also helps to prevent self-injury. The hug box allows people with tactile defensiveness to pull the handle and place the pressure themselves. The machine lets you decide how much pressure your body needs and how long you want it. The hug machine can be used to reduce tactile sensitivity in children, as well. Again, don’t do it without an occupational therapist to avoid any side effects. How does it work? Experts claim that the majority of people with tactile defensiveness feel are fearful of light touch and overwhelmed by all the stimulation they might get throughout the day. That’s why they need a more intensive and responsive pressure touch to feel relaxed. The hug box is highly expensive, so find out how you can test it before investing. Since each person is individual, the machine may not work for you. The professor of animal science, Temple Grandin invented that same stress-relieving therapeutic device called the hug machine. This American professor was diagnosed with autism at an early age. She felt overstimulated by touches and hugging yet craved deep pressure stimulation to calm down. When visiting a ranch, an 18-year autistic girl noticed how cattle calmed down in a squeeze chute for inoculation. She realized that deep pressure that the chute provided had a calming effect, which might help her relieve her hypersensitivity. The hug machine Temple Grandin invented features two 4 to 3-feet hinged side-boards with a thick and soft V-shape padding. There are also heavy-duty tubes and a complex control box that helps to produce a deep pressure effect. Parents of children with tactile defensiveness have reported that a moderate use of the hug box helps them reduce self-stimulating and restrictive behaviors and relieve or prevent tantrums. Temple Grandin had been using her squeeze machine for decades until it broke a few years ago. Although the effectiveness of the machine hasn’t been proven scientifically, it does have the positive results when used correctly. Even though deep pressure therapy usually helps children and adults with tactile defensiveness, coordinating your efforts with an expert is critical. They will demonstrate the right techniques and guide you towards investing in the most effective compression or weighted products. They will also help you modify a treatment to foster the positive results.